By now, a visitor to Angkor is likely to be in the frame of mind known to tourists who visit 14 European cathedrals in six days. Are they all they same? What's different about this next one? The answer involves roots, lots of roots. Thommanon is one of two small temples only a few hundred yards east of the Victory Gate. 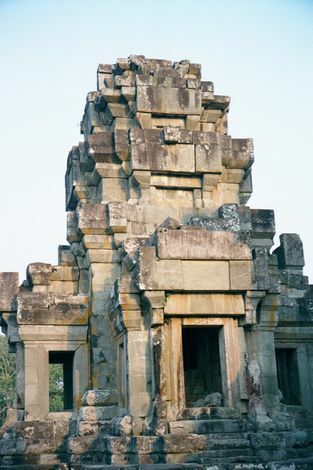 Both were built by Suryavarman II, the king who was simultaneously building the much vaster Angkor Wat. Thommanon is in good shape because it was rebuilt in the 1960s. Across the road: the Chao Say Tevoda. Although the two temples line straddle the Victory Way, they antedate it. 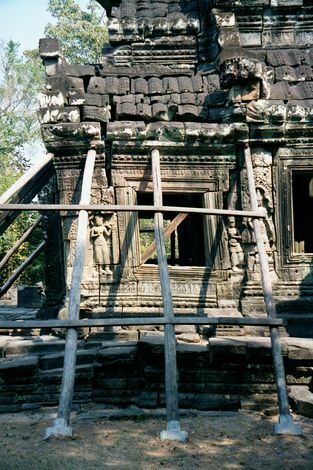 In 2002, when this picture was taken, the Chinese were rebuilding Chao Say Tevoda. A breath of the here-and-now: both Thommanon and Chao Say Tevoda lie in the half-kilometer gap between the Victory Gate and the Siem Reap River farther east. 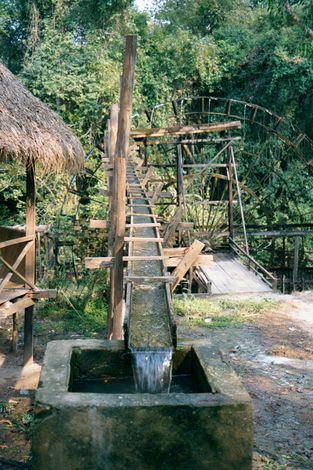 The river is shown here with a modern water wheel. What's it for, you ask? Fair enough, but note first that the river runs in a very straight line: its course was corrected long ago to parallel the east wall of Angkor Thom. 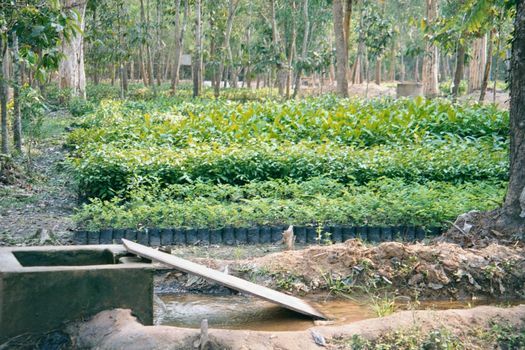 ... irrigated seedlings in a government nursery. 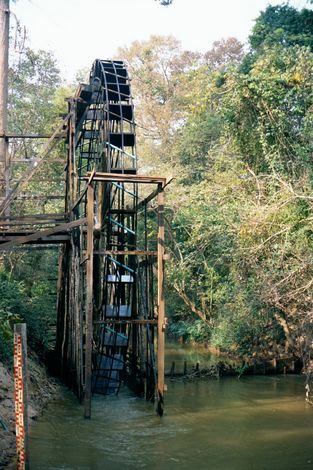 Immediately downstream from the waterwheel there's an old bridge, known in modern Khmer as Spean Thma, "stone bridge." 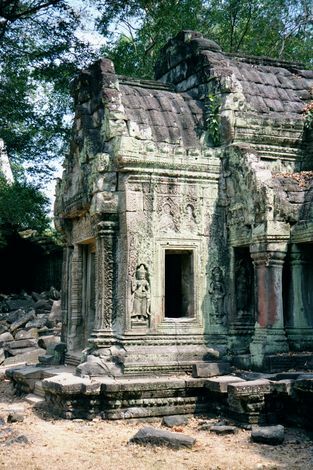 In Angkorian terms it's not so old: it was built in the 16th century of stones taken from abandoned temples. 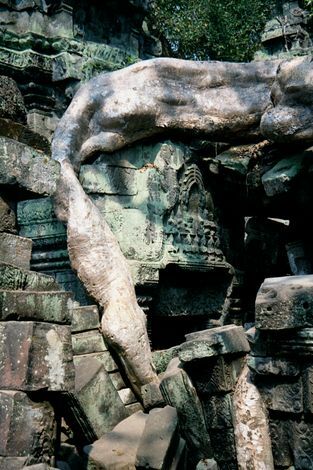 Still, it's a good illustration of Khmer corbelling. Such bridges dam rivers as much as traverse them, and the Siem Riep River has adapted by changing course and finding a path just to the east of this bridge. Not far beyond the bridge is Ta Keo, built about 1000 as the state temple of Jayavarman V. That makes it older than Angkor Wat, the Bayon, or any other works of either Suryavarman II or Jayavarman VII. 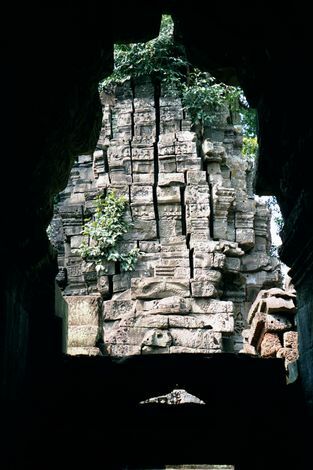 Although it's roughly contemporaneous with Phimeanakas, in Angkor Thom's royal palace, Ta Keo was built not of laterite but of sandstone floated down the Siem Reap River from mountain quarries 20 miles or more upstream. 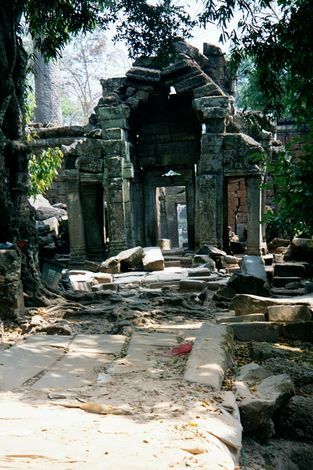 Ta Keo marks the southern end of Jayavarman V's Jayendranagari, a city of which nothing else remains. 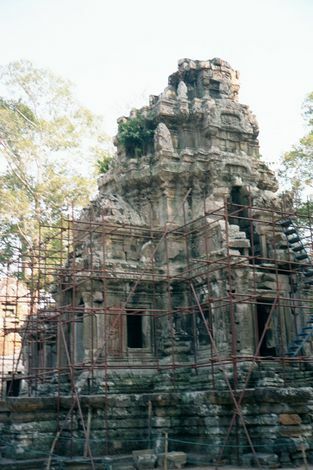 Ta Keo itself was abandoned before it was finished: that accounts for its almost entirely undecorated facade. 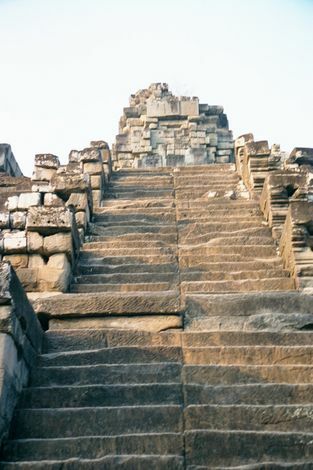 Here, one of the five towers at the top of the temple, built as "the mountain with golden peaks." 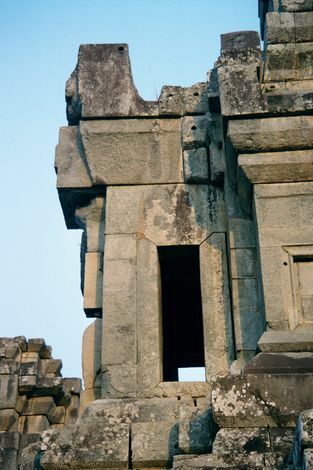 Although the effect is accidental, the unfinished stone is attractively free of the explicitly political messaging of the Bayon. 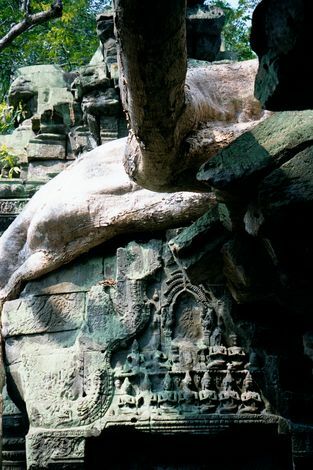 South and slightly east of Ta Keo is Ta Prohm, "Ancestor Brahma." 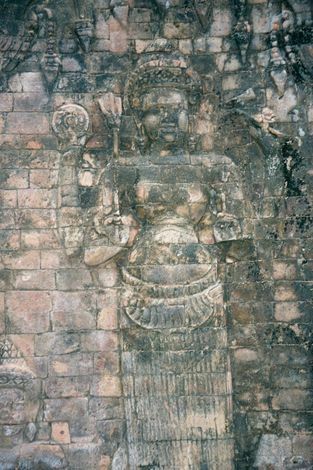 It's another work of Jayavarman VII. 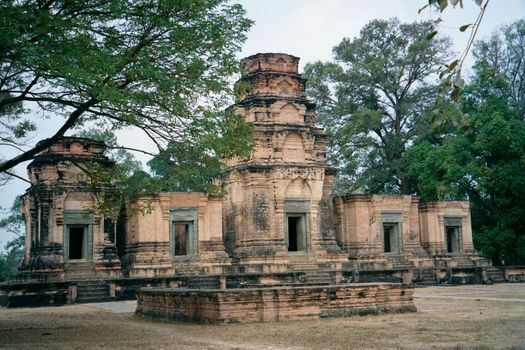 In fact it's a near twin to his Preah Khan. That city was dedicated to the king's father; this one, to his mother. 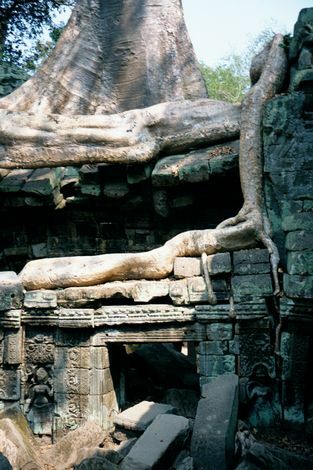 The distinction today is that Ta Prohm has been deliberately only semi-restored, so that visitors--in their thousands--can see the central monastery almost as 19th century visitors did. ...other parts are beginning to separate. 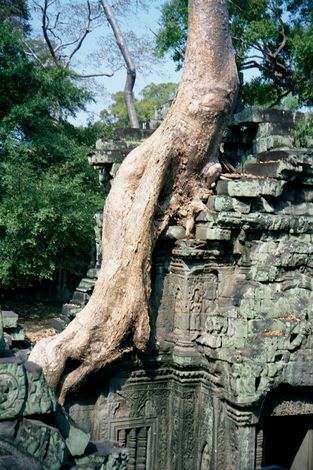 Note the construction technique, which unwisely stacked blocks directly atop one another, making it easy for roots to penetrate. This they have done with a vengeance. There are two species at work. 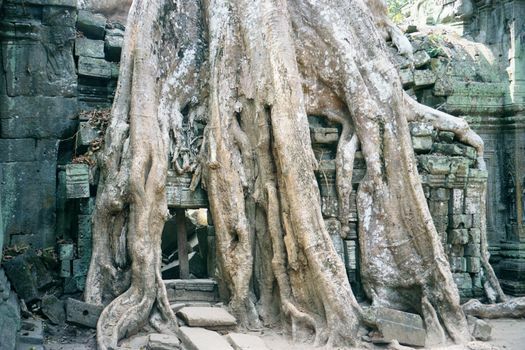 One, shown here, is a strangling fig, genus Ficus. The other is the mild-sounding silk-cotton tree, which doubles here as structural beam. Germinating from bird droppings, this silk-cotton tree has taken over the roof. 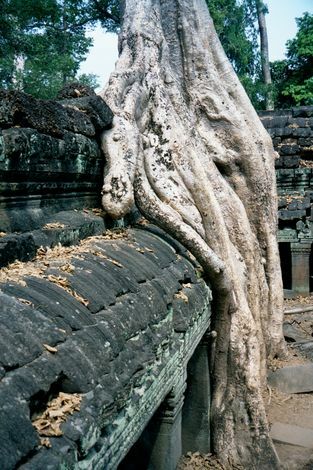 So long as they live, such trees support the temples as much as tear them apart. The trouble comes later, when the wood decays, leaving gaps. Fortunately, another generation of trees eventually stabilizes stones that have taken a tumble. A silk-cotton tree serves here as a buttress. You can't see it, but the roofs are alive with millions of tiny ants. 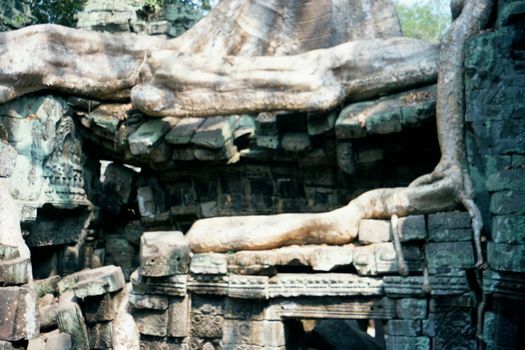 Southeast of Ta Prohm is yet another of Jayavarman VII's temples. 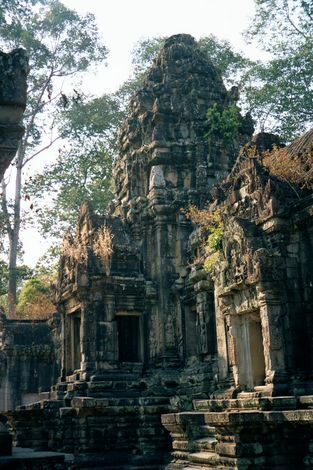 This is Banteay Kdei, the "citadel of cells." In this case, props have been placed none too soon. 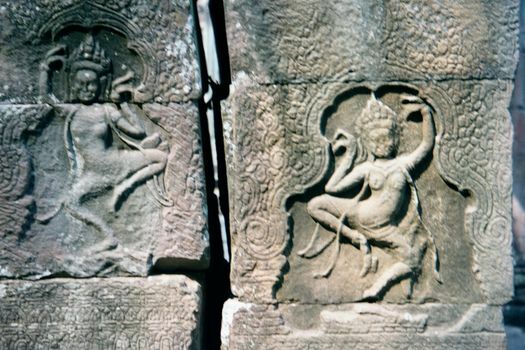 Apsaras dance the house down. 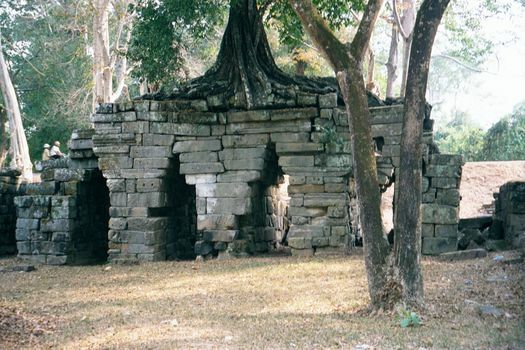 The oldest monument seen yet, these are the sanctuaries of Prasat Kravan, southeast of Banteay Kdei. They were built of brick, consecrated in 921, and reconstructed about 1960. Only two towers remain, the central and south; the central one is more complete. 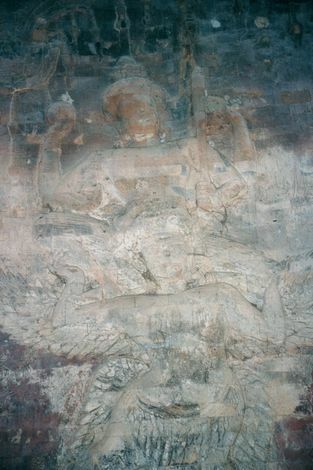 Its interior contains reliefs of Vishnu; the north sanctuary has reliefs of his consort, Lakshmi. The other sanctuaries were never decorated. 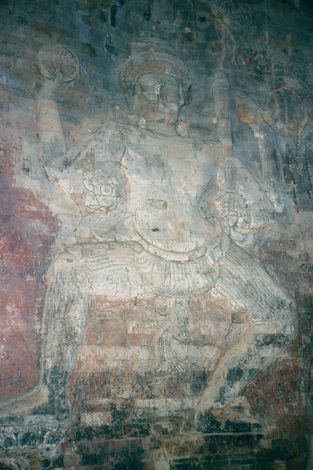 Vishnu with eight arms; attendants on either side. Vishnu crossing the ocean: one foot on a pedestal, the other on a lotus. 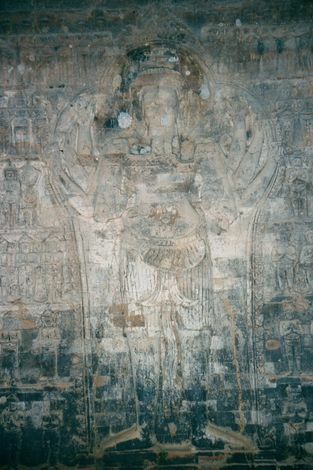 Lakshmi, in the north sanctuary.